Well it’s official: Marvel Studios is the Superman of Hollywood. No offense to Henry Cavill, but the superhero movie factory has a lot in common with the Man of Steel, in good and bad ways. There are those that love Marvel Studios for their vision and approach to superheroes, but there are others that pan them for having the same old story for every single movie. Some claim Marvel Studios create visual eye-candy and action-packed thrill rides, other claim that the formula for their movies has already gotten stale and don’t have enough substance. One thing’s for sure, Marvel Studios and Superman are impervious to damage and damn near unstoppable. Case-in-point, Ant-Man. In 1989, Dr. Hank Pym (Michael Douglas) decides to leave S.H.I.E.L.D. in order to protect his breakthrough shrinking technology (called the Pym Particle) from being used just as a weapon. 26 years later, Dr. Pym discovers his successor, Darren Cross (Corey Stoll), has nearly mimicked the science of the Pym Particle in order to create shrinking suits (called Yellowjackets) that’ll sell to the highest bidder. Fearing the worst, Dr. Pym and his daughter Hope (Evangeline Lilly) plot to steal and destroy Cross’ technology so it doesn’t fall into the wrong hands. Who do they choose to pull off the heist? Recently released con-man Scott Lang (Paul Rudd), who’s looking to redeem himself for the sake of his young daughter and find his true calling. Working with Dr. Pym, Hope and Scott’s three buddies (Michael Pena, David Dastmalchian and rapper T.I. ), Scott uses Dr. Pym’s shrinking suit and becomes (SPOILER) the Ant-Man. Ant-Man has been on people’s watch list for a while now, mostly due to its drama behind the scenes. Originally, writer/director Edgar Wright (Shaun of the Dead, Scott Pilgrim vs. the World) was supposed to helm the movie, but he left after Marvel Studios denied him of his vision (though he and Joe Cornish are still given credit to writing the screenplay and story). The final product, directed by Peyton Reed (Bring It On, Yes Man) and rewritten by Paul Rudd and Adam McKay (Anchorman, Step Brothers), is more like someone trying to make an Edgar Wright movie, at least from a director’s standpoint. Many of the sequences, like Scott’s training with the Ant-Man suit or Michael Pena’s character explaining how he gets information, are cut and move with the same energy of Wright’s movies. It’s even peppered into the action scenes, showing the Ant-Man using his shrinking abilities to dodge enemies and grow just in time for some quick jabs. Peyton Reed may not have his own distinguishable style on this movie, but he knows to give the movie a steady pulse and some hustle in its action. The script is also solid, with Wright and Cornish’s clever pacing blending well with Rudd and McKay’s cocky dialogue. The combination of the Wright-ish directing and the funny dialogue is probably why Ant-Man easily flies by in its 1 hour and 57 minute duration, making for what feels like the quickest movie in the Marvel Cinematic Universe. The cast is more of a mystery, specifically Paul Rudd. He’s known primarily as a supporting player in comedies, but whenever he’s in a lead role he’s always given another lead to support him (Seann William Scott in Role Models, Jason Segel in I Love You, Man and Tina Fey in Admission). Ant-Man is no exception, as Rudd is given very little solo scenes to entertain or stake his claim as a character. He’s either with Michael Douglas training or with Michael Pena planning a heist. Rudd’s not bad here, he just doesn’t show enough charisma or character development to hold certain scenes. If anything, his Scott Lang is meant to be a comedic punching bag, the struggling every man (though he is a criminal) thrusted into an extraordinary situation. It’s as if the movie knows you don’t care about Scott Lang the way you care about Tony Stark or Steve Rogers, so it doesn’t take the time to make him unique. Scott Lang may be the easiest character Marvel Studios have ever written, but then there’s Darren Cross. Corey Stoll’s villain is the typical “evil guy because he’s evil” character, much like Jeff Bridges in Iron Man. All he does is look creepy and yell when he gets mad. Don’t lose hope because the real star of Ant-Man is Michael Douglas, who acts everybody else under the table. The best thing is that Douglas isn’t just some old acclaimed actor doing a superhero movie for cash or to get props from their grandkids. Douglas is invested in the story and character of Hank Pym, even enjoying himself throughout the movie. Evangeline Lilly is the most badass character of the movie, showing Hank how to punch and keeping all the cocky nerds of the movie in line. Michael Pena, known more for dramas than comedies, steals every damn scene he’s in with his jovial energy. 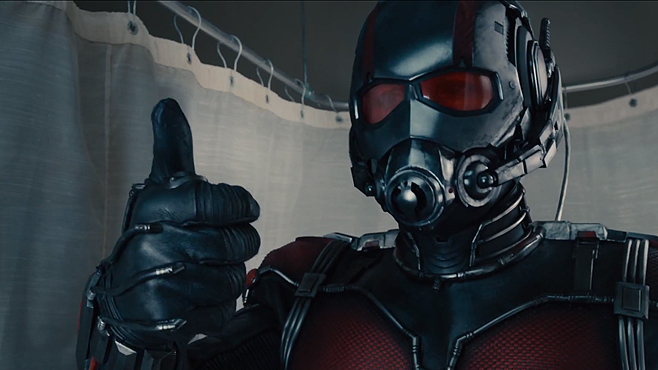 While the energy and comedy is on point here, Ant-Man is more of a typical heist movie than a typical superhero movie. That said, “typical” is still a common word used here, with the usual montages of training for the heist, planning the heist and getting the rag tag team together. Still, Ant-Man is a welcome burst of fun in the MCU canon. It’s still a similar vehicle, with different parts and the order of the set-up switched around a bit. Even though Edgar Wright’s vision wasn’t fully formed, the good bits break through to make a more exciting movie and keep the Marvel success story rolling. In fact, it may be the least important film in the set-up to the next Avengers movie, and maybe that’s a good thing. Ant-Man is much better as a stand-alone movie, trying to do Marvel’s formula a bit different, and that’s something Marvel Studios needs to do more often before they, like Superman, face their Doomsday. This entry was posted in Movie Review and tagged ant-man, Avengers, Marvel, Michael Douglas, movie review, Paul Rudd. Bookmark the permalink.